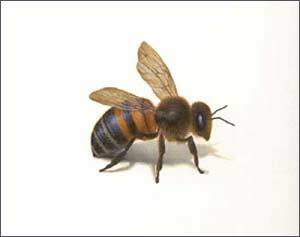 You can learn of the little bee to try to be useful. lthough the bee is so small an animal, it is very well known; and many learned men have spent a great deal of time in observing it, and have written many very curious things about it. They tell us that there is in every hive a queen, larger than the rest, whom they all follow and obey; and that if she dies or is carried away, they all leave their work and unless the queen is restored or another one provided, they refuse to eat, and soon die. Only one queen is allowed in a hive at a time. She does not go out to gather honey, but those who attend upon her bring to her cell as much as she wants. It is very pleasant to watch the bees at their work, for they are quite as busy as the ants, and as they are so much larger, it is more easy to see what they are doing. Every thing about them seems curious and beautiful; their waxen cells, their manner of gathering honey and storing it up, their neatness and order, all are admirable. They are perfectly harmless when left to themselves; but if they are attacked, they fly around the person who disturbs them, in great numbers, and sometimes sting him very severely. David once said of his enemies, "They compassed me about like bees." Honey is often spoken of in the Bible. When Jacob wished his sons to go down into Egypt a second time to buy food, he said to them, "Take of the best fruits of the land in your vessels, and carry down the man (Joseph) a present; a little balm and a little honey, spices and myrrh, nuts and almonds." God told the children of Israel that he would give them "a land flowing with milk and honey," meaning one that was beautiful and fertile, producing abundantly every thing that would be needed for their comfort. When David had been obliged to flee from Jerusalem to escape his wicked son Absalom, he was in great want of provisions for himself and his followers. After a long and fatiguing march he reached a certain city; and there three rich men who were friendly to him, sent "wheat, and barley, and flour, and parched corn, and beans, and honey, and butter, and sheep, and cheese," besides beds for them to rest on; "for they said, The people is hungry, and wary, and thirsty in the wilderness." Perhaps no man ever loved the commandments of God more truly than king David. He says in the Psalms, "How sweet are thy words unto my taste! yea, sweeter than honey to my mouth!" and again he says of God's judgments, "More are they to be desired than gold, yea, than much fine gold; sweeter also than honey and the honey-comb." Besides the bees that live in hives, there are many called wild bees, which live in the woods, and put their honey in the clefts of rocks, or in old trees and other similar places. In the fourteenth chapter of Judges you will find this story: There was a very strong man named Samson, and once when he was travelling by himself in a lonely place, a young lion came roaring along in the very path where he was going. Would you not have been afraid? I suppose Samson was, at first, for the lion was very strong and very hungry, and Samson had nothing in his hand to kill him with. But God gave him strength, and when the lion came up, Samson caught hold of him and tore him in pieces, as you would tear a piece of cloth. Then he left him dead on the ground. Sometime after he came back the same way, and thought he would look after the lion that he had killed. He soon found the skeleton, that is, the dry bones without any flesh on them; and when he looked at the parts of the dead lion he found that a swarm of bees had been there, and laid up a great plenty of honey. So he took some of it in his hands to eat as he went along.